As the autumn leaves drop, the berries and fruit on shrubs and trees start to stand out and show their colours. 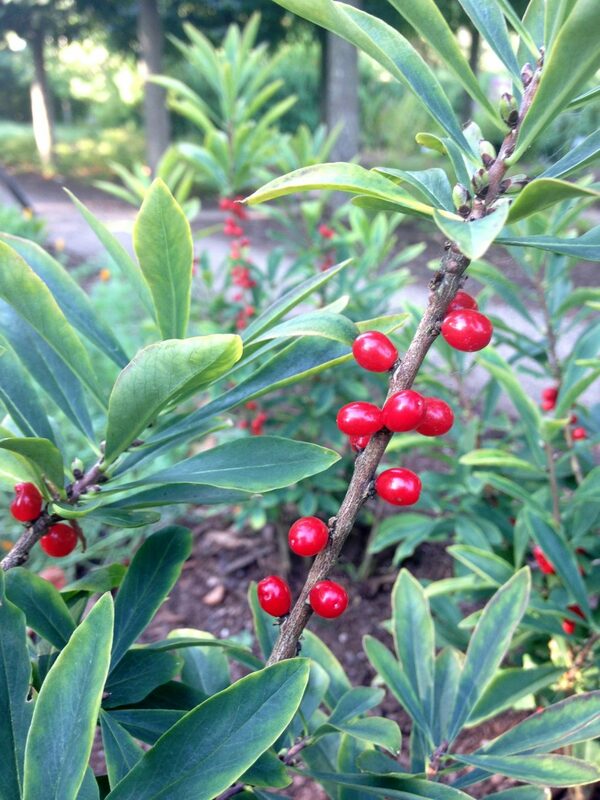 A showy, yet deadly, berry that shines this time of the year can be found innocently hanging on the Daphne plant. The berries are enticing as they are scarlet red and glossy. They look good enough to eat, but are far from it. The Daphne plant contains two extremely active and deadly toxins: Mezerein, which is an acrid resin that causes a severe skin irritation; and Daphnin, a bitter, poisonous glycoside. All parts of Daphne plants are poisonous including the flowers, leaves, and berries. As with many toxic plants, Daphne has been used medicinally for centuries. The bark and root are reputed to be potent medicine for rheumatoid arthritis and ulcers. A very dilute tincture of Daphne (Daphne Mezereum) is used in Homeopathic medicine. Forests and gardens are filled with plants that can both heal and harm us. Being informed and having accurate identification information before eating or touching plants is crucial. Many of us will remember our grandparents or parents teaching us what plants to avoid and which are safe to eat. Sadly, this invaluable plant knowledge is quickly becoming lost in our technological world. There are some great resources available to begin learning about plants. The Nova Scotia Museum has a website called The Poisonous Plant Patch which has a wealth of information that could be life saving (https://novascotia.ca/museum/poison). If you prefer to be outside rather than on your computer like me, take a walk through the Harriet Irving Botanical Gardens where plants have botanical labels, and bring a field guide to learn more. The Gardens are open all year round and free to the public.